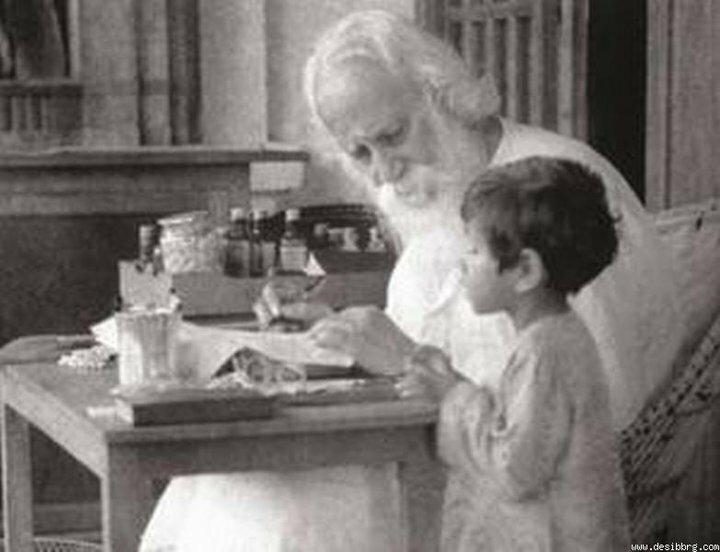 The young boy standing by Tagore is not Satyajit Ray. He is Late Abhijit Chanda, only child of late Anil and Ranee Chanda. Anil was a Minister in the Indian Parliament beside being secretary of Tagore. He was a very distinguished scholar as well. Ranee Chanda was a noted litterateur and painter. Kindly rectify the error now circulating for a considerable period through facebook and other fora. I run a page and I have repeatedly posted that this kid is not Satyajit Ray. I have posted the link to this page wherever I have come across this picture as one of Satyajit Ray's. These morons are so illiterates that they will make us forget our history. This is anil chandra not Satyajit. Absolutely, I couldn't agree more! But the name of the boy is Abhijit Chanda, not Chanda....son of Anil & Rani Chanda. these morons are so illiterates that they will make us forget everthing. This is abhijit chandra not Satyajit. @ Shyamal Mazumder- this pic is probably the most widely circulated wrongly captioned pic. There were so many discussions in Tagore and ray forums ion the net, including Facebook. Good we have a definite link now. Thanks for identifying the kid.